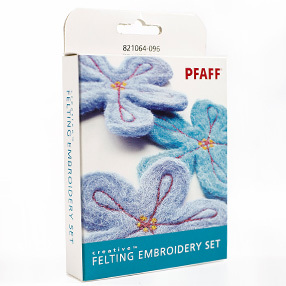 I have such fun felting on my machine with the Felting Embroidery Set. Although felting can be done using almost any weight of material, it is usually most closely associated with woolens, roving, etc. and cooler weather. Felting is a process where materials or threads are meshed together rather than sewn together by using barbed needles. The threads become a part of each other, creating beautiful new fabric. 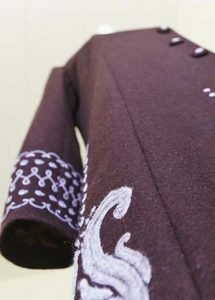 Felting can be done on a fabric or can be done as a free-standing form. Felting on the back of plain denim using only the denim itself, for example, gives a beautiful white design on the front of the denim. Felting on the back of a sweat shirt brings the color of the fleece side to the front. Free-standing felting is usually done using wool roving, creating shapes for home décor or 3D accents on flat surfaces. There are felting machines that have multiple needles, there are sets such as are available for Husqvarna Viking and Pfaff machines and there are hand felting accessories available. Felting is even a wonderful tool for creating texture in quilting fabrics to add variety and uniqueness to quilt blocks! For a few examples of this art form, take a look at this Husqvarna Viking blog link. 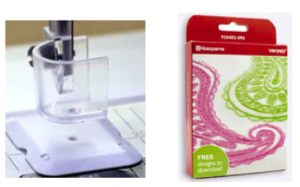 The YouTube link is a demonstration of the Felting Embroidery Set for the Husqvarna Viking, but the set up and use is exactly the same on the Pfaff machines.